It’s a subject that not a lot of people want to openly talk about, especially when they are talking about themselves or loved ones, but mental health is a serious subject that we need to learn to be more willing to discuss without shame. Everybody knows someone who has, is, or will struggle with some sort of mental health issue; it is simply that common. People who have serious struggles with depression or other types of mental health challenges will (and should) turn to medication and/or counseling as forms of treatment. But I’m not expert in treatment of mental illness, and I don’t want to delve into those methods here. What I do want to talk about is my own mental upkeep, or as it’s more commonly known, mental health maintenance. There are lots of things you can do to work on mental upkeep. Living an active lifestyle, healthy eating, stress management, setting life goals, working your mind, and valuing yourself are a few things that are commonly prescribed as part of a mental upkeep regime. I have found that pinball is a fantastic way to engage in several mental health-positive activities. Let’s take a look at my own situation. Years ago, I wasn’t doing a very good job with the whole mental upkeep thing. Sure, I had hobbies, I tried to live healthy, and I made an effort to be social. But man, I was STRESSED OUT and felt that I had little actual control over things. My wife and I had just had our first baby, and due to a combination of insurance scam/fraud by our agent and some medical complications, we were left with mountains of medical debt. On top of that, I was in need of a job change, but our financial situation made starting something new a scary prospect. I felt like I had little control over much in my life. And I wasn’t just stressed and busy, I was actually diagnosed with depression and put on a variety of prescriptions over time to help me out. At times, my mind was a dark place. Around this time, my transition from arcade collector to pinball collector was in full swing. Pinball machines were easy to find at good prices, and I was able to pick up lots of project machines, fix them up, and sell what didn’t click with me to fund the next couple of projects. I took on a lot of freelance repair work, and I even did a handful of restorations. Pinball gave me a much needed injection of extra income, which went almost entirely to mortgage and medical bills. 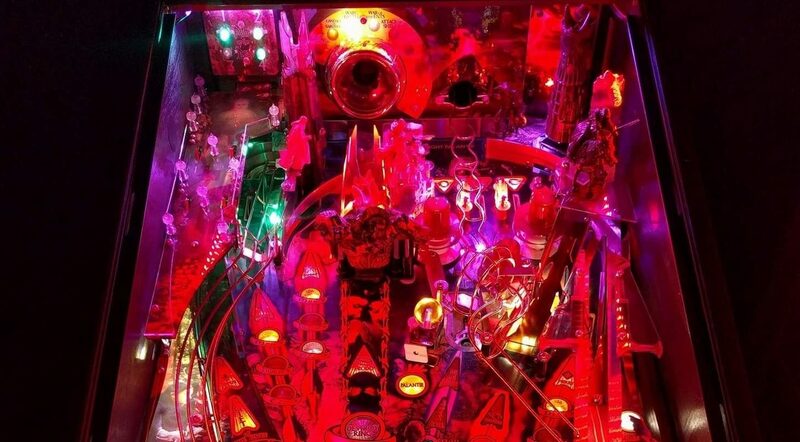 And while a little bit of extra money helped with the stress, it’s the other aspects of pinball that really kept me from having a total mental breakdown (though I still got close a few times). Repair and restoration aside, I learned some metaphors for life in pinball as well. Early on, I will admit that I was helpless against the randomness of pinball. I plunged, I barely aimed my shots, and I held on for dear life while the ball usually went careening wildly around the table. It was still fun, but I had no idea how many techniques were out there to make me better. After attending some shows and seeing some high level play on display at tournaments, I started to realize that I didn’t have to let randomness and chaos reign. I started figuring out how to nudge properly, how to aim better, how to catch and trap pinballs, and how to understand game rules. I improved rapidly as a player, and I felt like there was at least something in my life going in a positive direction and I felt good about it. Eventually the dots connected in my head. I could let the randomness of life keep throwing haymakers at me while I waited for the next one to hit home, or I could fight back. With full support of my wife, I made a professional leap of faith which required that I learn and adapt a lot of my work skills. I de-prioritized some things, I moved others up the priority list. Slowly, things started working out, though it always felt like we were on shaky ground. I realized that fighting for control was worth the effort, however, and I was very encouraged to keep punching back. The other lesson pinball taught me was that the big win didn’t come often, and it was never guaranteed. Now, I played sports growing up and in high school and college. I played on teams where we won big championships, I played on all-star teams, and I also played on teams where we got trounced every time out. The highs and lows of competition weren’t anything new to me. But it had been years since I tried my hand at competing in anything that was relatively new to me. I started entering tournaments, and being inexperienced, my play was wildly inconsistent (it still is, to be honest). In unlimited qualifying, I could generally make finals after emptying my wallet out, only to get ran in the first round of knockouts. I was quickly taught that brief moments of strength were no substitute for consistency. This was an easy lesson to lift from pinball and apply to work, health, and stress management. Early on in the hobby I was pretty much focused on myself. I chased down the games that I wanted, I focused on what I wanted to see at a show, and I watched my own results intently in tournament standings. Eventually I started to get integrated into the pinball community as a whole, however. I started spending as much time talking with people at shows as playing pinball. I started picking out people to follow in tournaments and cheer for them. When making a sale or picking up a new game, I got to know the person I was dealing with instead of quickly loading up and taking off. Through this, I really started to love pinball, because I finally tapped into what pinball really had to offer. And funny enough, the more I focused on being a good and active member of the community, the more the things I initially cared about became easy. Finding good deals on games was easier with a good network of people to hit up, I could track down the games I wanted to buy more quickly, and I found that tournaments were less stressful as I could chat with and draw encouragement from fellow players. In the midst of all this, I realized that my social life had really suffered outside of pinball. Due to money worries, the demands of a new child, taking on freelance work to support my main profession, and just general issues of depression putting me on lockdown, I really hadn’t been seeing anybody outside of my family members and co-workers for a long, long time. When I did go out, I kept it short and cheap. 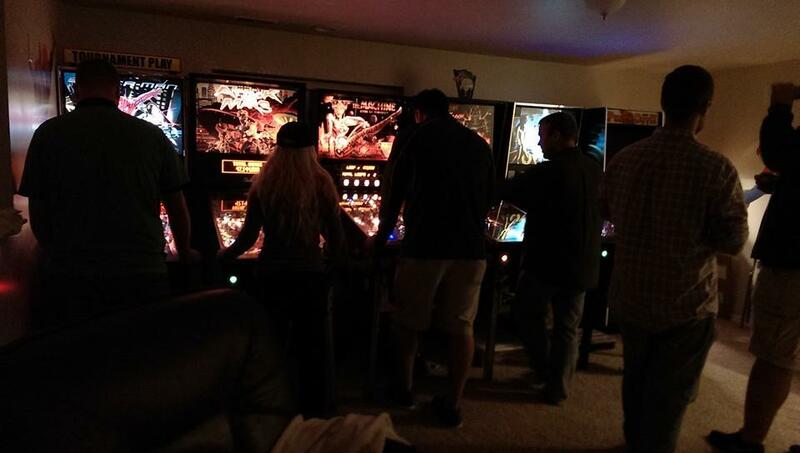 Pinball gave me a way to socialize in a lot of different ways. I had a lot of online communication with people after starting up my podcast (http://thepinballpodcast.com) with Don, I got invited to peoples’ homes to play pinball, I had events in my own home, and I even started going on occasional road trips with fellow pinball enthusiasts. Over time, I made some much needed friends, and they really helped me remember that I wasn’t the only one with problems. I see in a lot of newcomers to the hobby what I went through when I was new to pinball. I chased the A titles and the newest games. If it didn’t have a DMD, I had a hard time caring early on. When I attended a show, the first thing I did was line up to play Medieval Madness, Monster Bash, Indiana Jones, and the other games that were sitting in the IPDB’s top ten list. I prioritized those games for my collection as well. Well, after two to three years of this, I started to feel like I had “seen the best of what pinball had to offer.” Boy, was I wrong! Getting out of my initial comfort zone and exploring games from the ’80s, 70s, 60s, and earlier opened me up to so many different ways to play and think about pinball. Depth of code and ball speed weren’t everything, and I ended up finding myself chasing down classics for my collection. I noticed that some people turned their noses up at some of my early SS or EM pickups, but I didn’t care. I knew that I enjoyed them, and it made pinball better to have variety in my home collection. Around this time I also realized that life couldn’t just be hyper focused on a small handful of things. After family, work, and pinball, there really wasn’t time for much else. I started easing up on the constant stream of pinball activity and rediscovering other hobbies that I had shoved aside. I got back into fly fishing, I picked video games more often, I got back into playing sports competitively (including co-ed soccer leagues with my wife), and I spent a lot more time outdoors. I let balance creep back into my life, and it really helped me to handle the weight of responsibility so much better. Much like pinball machines need maintenance, such as regular cleanings, part replacements, and often major repairs, I realized that my mind needed the same things in a figurative sense. Over the years, and it took a long time, I’ve been able to manage my depression more effectively by working on my mental upkeep. With an amazingly supportive and understanding wife, I’ve made sure to lean on the things I love, such as pinball, to help me take a break from worry and responsibility at regular enough intervals to stay sane. For me, pinball really helped me find a path to a better head space. Whether it’s pinball, yoga, basketball, logic puzzles, stamp collecting, shrubbery design, or anything else, it’s extremely important to engage in mental upkeep. The biggest thing, however, is that if you’re struggling with depression, be it professionally or self diagnosed, is to know that you don’t have to suffer in silence with it. There’s no reason to feel shame. Speak up to family and friends. You’ll be surprised at how much people really do care, even when it feels like they don’t. If your options are limited there, reach out through your online networks. Find support as soon as you can, and do not neglect proper mental upkeep as an important part of getting and staying well. What a wonderful article. I appreciate your bravery in discussing this issue. My husband has become a pinball fanatic over the past year. I think it is so important to destigmatize depression. I encourage you to continue writing about your experiences. Well spoken. I started getting into pinball because of stress getting out of control and needing a way to unplug form things.